At MeetingPlay, we have conversations with top planners on a daily basis, answering questions and discussing ideas for new apps. To share some of the insights we’ve learned over the past year, we’ve collected a short list of the most requested app features — the ones we get asked about the most. As we all look ahead to a new year of exciting events, it's useful to take a look at the event tech landscape. Here are the 6 features we get asked about the most, so you can be sure you're utilizing apps and features most effectively. 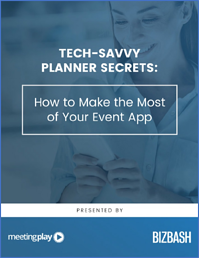 The agenda is always the most used event app feature for attendees. 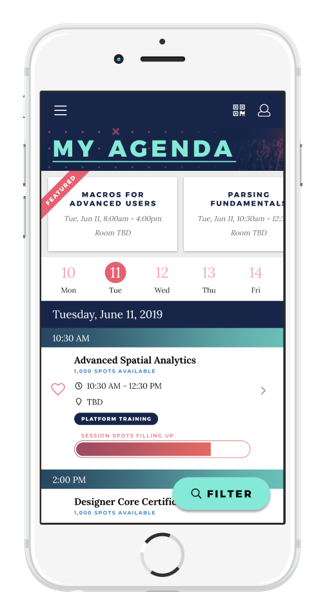 Planners are especially interested in agenda customization: how to schedule meetings, add a session to a track, or how to see if a session is getting full. At an event, everything starts with the agenda. Here are some features we suggest considering to make sure you start your event the right way. Parent-Child Relationship: If an attendee brings a guest to an event, we can use what’s called a "parent-child" relationship to associate an attendee with their guest. You can also expand this feature so that the attendees can view their guest's agenda as part of their own personal agenda. Scheduling meetings: As attendees go about their networking, it helps to be able to schedule with others during the event. We typically integrate meetings directly into the personalized agenda. Session capacities: For attendees, it’s useful to see if a certain session is starting to fill up. This is important when you need to pre-register for sessions. If you are waiting to register, session capacities might signal that if you don’t register for that session soon, you could miss out. Tracks and sub-tracks: Our apps use tracks to organize sessions into categories. Tracks are especially helpful when you have concurrent sessions. For example: if a marketer attends a sales and marketing meeting, they would want to be on a marketing track. In their app, they can see all of the marketing-related sessions, helping them seek out the right experiences. Sub-tracks are another appealing option. For example: In addition to “Marketing,” they might also be on sub-tracks that are specific to “Brand Marketing” or “Partner Marketing.” This is just one example; tracks and sub tracks offer endless ways to make organizing sessions much easier for attendees. It goes without saying: people attend events to network. An app’s matchmaking feature makes sure attendees maximize their time at the event by pinpointing more relevant and meaningful connections. Event app matchmaking uses an algorithm to make recommendations on the best connections for each attendee, providing a more personalized experience. 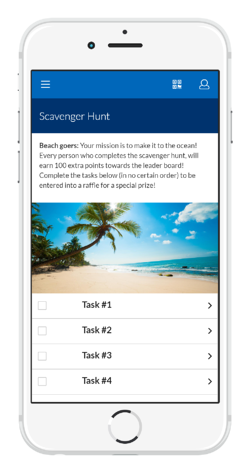 Gamification is a common app feature, but with so many configurations and possibilities, it's an attendee event app feature we get asked about a lot. The first thing to understand is that gamification goes far beyond just awarding points for certain actions. You can create your own custom games like photo contests, scavenger hunts or bingo. It all depends on your event goals and the type of engagement you want to encourage. Check out our blog post on gamification for inspiring examples we've seen including digital slot machines displayed on massive screens. For planners looking to boost engagement, ARS is another highly sought-after feature. It's not just about polling, although it certainly works well for that. You can really get creative with ARS. For example, a speaker might ask an open-ended question, and then generate a word cloud on screen, on the spot. We've seen planners use ARS to send quick surveys to gather insights in real time, and to hold a company-wide vote. Learn more about ARS by clicking here. Augmented reality is in a unique place right now: it's frequently asked about, though not often requested. As with most emerging technologies, there is a lot of curiosity around AR, but at this point, not much actual utilization. If you're like most planners who are curious about AR, but don’t know where to start, take a look at this post. Finally, the big question we’re always asked has to do with integration. Through custom APIs, event apps can utilize one-way or two-way integrations across platforms. Two-way is especially valuable because it means that all tools utilized during the event are speaking to and updating each other. You, the planner, determine the detailed information you want to push and pull. Most commonly, this includes attendees, attendee agendas, and the event agenda. Rules and details are discussed through the spec process to determine which system “wins” if there are conflicts in a two-way API. BONUS: If you want to learn more about features being utilized by your peers - a few months ago, we surveyed a wide cross-section of planners and discovered interesting ways event organizers who use mobile apps for their events make use of these tools, especially around what they consider to be the best event app features.. We worked with BizBash to develop a white paper that presents a deep dive into these themes. You can download that paper here. It’s always difficult to predict exactly how event technology will evolve over the next year, although we have some ideas about trends for 2019. As always, stay tuned to the MeetingPlay blog for updates and best practices on the latest emerging event tech. And if you want to discuss your next app with one of our experts, reach out and schedule a free demo.